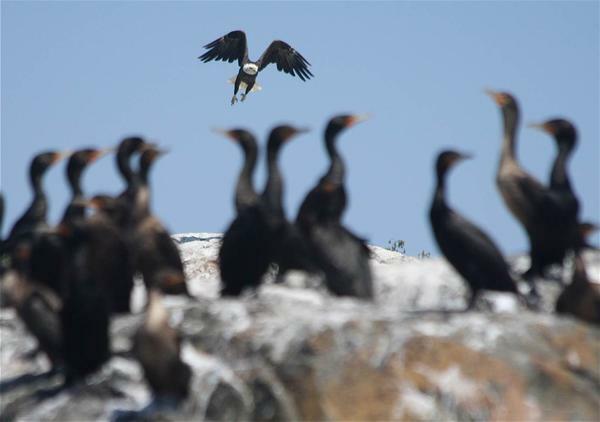 A bald eagle soars over double-crested cormorants off Vinalhaven. By the early 1980s, the eagle population in Maine had dropped to fewer than 40 nesting pairs. But now they are flourishing. Today there are well more than 700 pairs nesting in Maine. Bird tour operator and scientific researcher John Drury pilots his old lobster boat out into Penobscot Bay, about 15 miles off Rockland. He has been visiting a rocky archipelago of seabird colonies here for decades. He watches a black-headed, juvenile eagle arc into the air, and two gulls rising to chase it off. Around the bend a handful of great cormorants — big, dark birds with long, hooked beaks — guard their nests. And out on a nearby ledge several more young eagles loaf and watch. “They’ve moved out here to forage, close to the rich, delicious birds,” Drury says. From Drury’s perspective, that’s a problem. Those great cormorants living under the eagles’ gaze are some of the last to breed in the U.S. Once extirpated here, the great cormorants too have made a comeback, reaching a peak of 240 nesting pairs in the early 1990s. “And there are 40 pairs this year — and eagles have been attacking every colony every year, pretty much,” he says. It’s not just great cormorants that are getting harassed. About 50 miles southwest of Drury’s birding grounds, in Casco Bay, state biologist Brad Allen is documenting declines in several avian species, some common, some not. This day he’s looking for great blue heron, designated a species of special concern in Maine. “There’s one right there — is that an eagle or a great blue heron?” he says. It’s a heron — a majestic, prehistoric-looking bird. When Allen last studied the species in the 1990s, he counted roughly 1,200 nesting pairs along the Maine coast. 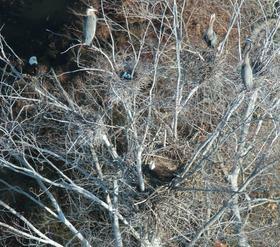 Now the coastal heron population is a third of that. Allen says eagles are contending with a big drop in their traditional coastal prey — cod, salmon and other fish whose populations have been hurt by overfishing, dams and warming ocean temperatures. “In the absence of a bay full of fish they are going to eat the next available chunk of protein, and it might be a cormorant or a young great blue heron,” he says. Seabirds face other threats as well. But the eagles are putting real pressure on, and with their population growing at an 8 percent clip around the country, it’s an emerging issue for wildlife managers. “We are headed into a golden age for eagles. We haven’t had this many eagles in the Chesapeake since colonial times,” says Bryan Watts, director of the Center for Conservation Biology at Virginia’s College of William and Mary. Watts says that as in the Gulf of Maine, Chesapeake Bay is seeing growing eagle predation on other birds, some of them rare. Watts says he can foresee a time when the issue becomes acute enough to force a new approach to eagle management — focusing less on the single species and more on its role in a larger ecosystem. “In terms of eagles, because of their status within our society, it’s a discussion that’s been put off, but ultimately we’re going to have to face,” he says. Right now the only real strategy to deal with rising eagle predation is to scare them off. Maine hosts the only U.S. population of Atlantic puffins, a clown-faced little avian popular with birders. During the nesting season when the puffin eggs and chicks are most vulnerable, volunteers are posted at some of their colonies to wave off marauding eagles. But when humans aren’t around, puffins, like the other seabirds, will face a growing number of eagles — on their own. And another kind of conflict could become more fraught, as the eagles expand their territory. Watts says in his region, wildlife management has put restrictions on some $10 billion worth of private property to protect eagle habitat. So it won’t be just the great blue heron that’s subject to rising pressure from the iconic bald eagle, but perhaps a more formidable occupant of the ecosystem — the great American landowner. Copyright 2016 WMEH-FM. To see more, visit WMEH-FM.